World Tour team standings leader Quick-Step Floors have now nabbed at least a victory in the last nine Grand Tours. Elia Viviani carried into the Vuelta a España the superb form that propelled him to a well-deserved win at the Cyclassics Hamburg one week ago and comfortably sprinted to victory on the race’s third stage, which saw the peloton travel from Mijas to Alhaurin de la Torre, over 178.2 kilometers that packed a total of 2600 meters of elevation and a 20km-long first-category climb in the first part of the day. “This wonderful season continues with a beautiful and very special moment. First Vuelta win, first Grand Tour victory in the Italian Champion jersey, all these make up for a perfect day, but I couldn’t have pulled it off without this incredible team, who did again a marvelous job. It was difficult to control such a tough stage by our own for 90% of the time, but we prevailed again thanks to the Wolfpack’s fantastic spirit”, a beaming Elia said as he stood against the railings, after capturing his 16th success of the year. Quick-Step Floors did what they know best on Monday, controlling a six-man breakaway for the most part of the day, not panicking even with 40 kilometers to go, when five riders attacked from the bunch trying to stir things up, and bringing everything back together ten kilometers from the finish, before taking Elia to the front with the flamme rouge in sight. 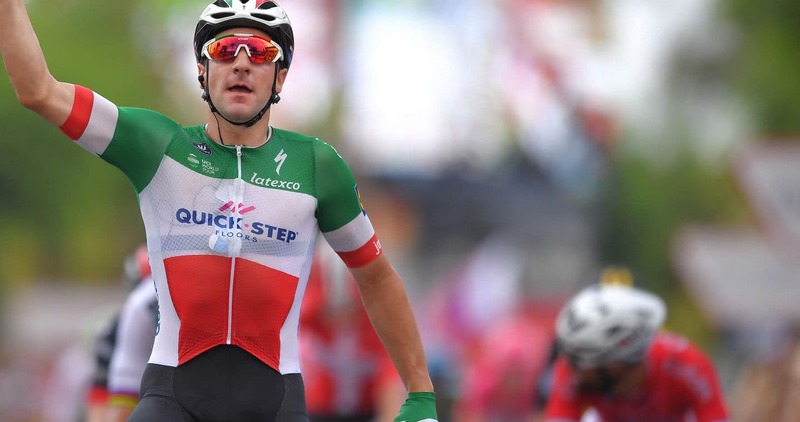 Led out by Danish Champion Michael Mørkøv, Viviani made his jump inside the final 200 meters and put in a storming sprint, beating Giacomo Nizzolo (Trek-Segafredo) and Peter Sagan (Bora-hansgrohe) by a bike length. The 29-year-old Italian, who is riding the Vuelta a España for the second time in his career, was eyeing this stage before the start of the race and at the finish in Alhaurin de la Torre was full of praise for his teammates, who perfectly executed the plan concocted at the pre-stage briefing in Mijas. 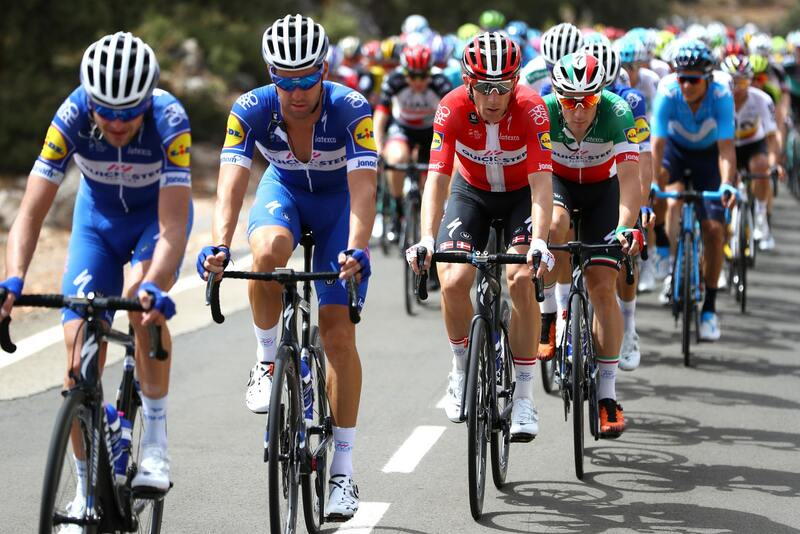 Viviani – who netted Quick-Step Floors’ 85th Grand Tour stage victory – wasn’t the only rider of the team to take it to the podium on Monday afternoon. Laurens De Plus, who wore the white jersey of the combined classification, retained his fourth place in the overall standings and was rewarded with the best young rider prize. “The goal was to control the stage and win it with Elia, and having accomplished that makes up happy. We are having a great start to the Vuelta a España, I feel good and I’m now curious to see how my legs will respond in the high mountains”, said Laurens ahead of stage four, which will finish on the 12.4km-long climb of Sierra de la Alfaguara.